In this article, the author will demonstrate how to use the Random Forest as a classifier and regressor with Big Data processing engine Apache Spark. In this article, I will demonstrate how to use Random Forest (RF) algorithm as a classifier and a regressor with Spark 2.0. The first part of this article will cover how to use the RF as a classifier; while the second part will focus on how to use the same algorithm as a regressor on real datasets. Random forest [1, 2] (also sometimes called random decision forest ) (RDF) is an ensemble learning technique used for solving supervised learning tasks such as classification and regression. An advantageous feature of RF is that it can overcome the overfitting  problem across its training dataset. A forest in the RF or RDF usually consists of hundreds of thousands of trees. These trees are actually trained on different parts of the same training set [1-3]. More technically, an individual tree that is grown very deep tends to learn from the highly unpredictable patterns. This kind of nature of the trees creates overfitting problems on the training sets. Moreover, low biases make the classifier a low performer even if your dataset quality is good in terms of feature presented . On the other hand, an RF helps to average multiple decision trees together with the goal of reducing the variance to ensure consistency by computing proximities between pairs of cases. However, this increases a small bias or some loss of the interpretability of the results. But eventually, the performance of the final model increased dramatically. It can be applied efficiently to large-scale datasets for both classifications as well as regressions analysis making it scalable based on increasing data size. Consequently, it's a perfect algorithm for making predictive analytics on Big Data. It can handle thousands of input features and variables at a time. That means high dimensional dataset can be handled and used to make predictive analytics using the RF model efficiently. Above all, as usually RF algorithm does not overfit, so you can run and build the model by specifying as many trees as you want. For more on pros and cons of the RF algorithm, readers can refer the book titled "Large Scale Machine Learning with Spark" published recently with the latest machine learning algorithms with Spark 2.0.0 release . Model building parameters like a number of classes, a number of beans and number of maximum depth etc. Nevertheless, finding the optimal number of trees is a matter of hyperparameter tuning a part of tuning machine learning model. Therefore, optimal numbers of trees say N can be found by performing hyperparameter tuning using cross-validation and train split of the dataset. Alternatively, it can be found by observing the out-of-bag error [6, 7] which is often expressed using in terms of training and test error [1, 2]. After that proximities  are computed for each pair of cases when all the trees are built using the complete dataset (unless you randomly split the data into training and test set). Furthermore, "when two cases occupy the same terminal node, proximity is increased by one for each case" . However, at the end of the each iteration, proximity values are normalized by dividing them by the number of trees (that were built and specified during the training period) . You might be wondering why the proximity calculation is so important! The reality is that the proximity calculation has many contributions towards making the prediction better. For example, for replacing missing data, null values and locating the outliers from a set of the cluster. Finally, it also helps produce low-dimensional views of the data [1, 5, 6]. On the one hand, for a classification problem with say n features, the value of n is usually rounded down as √n. That means, only √nfeatures are used in each split on the training set. On the other hand, for a regression analysis problem using RF, the inventors (i.e., Leo Breiman and Adele Cutler et al.) recommend using the rounded value as n/3 with a minimum tree node size of 5 as the default . How Did Spark Implement the RF Algorithm? The depth of the tree and quantile calculation strategy etc. If the number of trees is 1, then no bootstrapping is used at all; however, if the number of trees is > 1, then the bootstrapping is accomplished. Where, the parameter featureSubsetStrategy signifies the number of features to be considered for splits at each node. The supported values are "auto", "all", "sqrt", "log2", "onethird"
Finally, the random seed is used for bootstrapping and choosing feature subsets to avoid the random nature of the results. As already mentioned, since RF is fast and scalable enough for the large-scale dataset, Spark is a suitable technology to implement the RF to take the massive scalability. However, if the proximities are calculated, storage requirements also grow exponentially. The next section shows a step-by-step example of using the RF as a classifier with Spark 2.0. For the demonstration purpose, Spark 2.0.0 will be used. The application that I will be showing is written in Java as Maven project on Eclipse. Image processing or computer vision which is two classical but still are emerging research areas that often make the proper utilization of many types of machine learning algorithms. There are several use cases where the relationships of linking the patterns of image pixels to higher concepts are extremely complex and hard to define and of course computationally extensive too . From the practical point of view, it's relatively easier for a human being to recognize if an object is a face, a dog, or letters or characters. However, defining these patterns under certain considerations is difficult. Additionally, image related datasets are often noisy. In this section, we will develop a model similar to those used at the core of the Optical Character Recognition (OCR) used as the document scanners. This kind of software help to process paper-based documents by converting printed or handwritten text into an electronic form to be saved in a database. 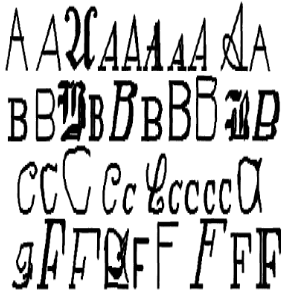 When an OCR software first processes a document, it divides the paper or any object into a matrix such that each cell in the grid contains a single glyph (also known different graphical shapes), which is just an elaborate way of referring to a letter, symbol, or number or any contextual information from the paper or the object. To demonstrate the OCR pipeline, let's assume that the document contains only alpha characters in English that matching glyphs to one of the 26 letters: A to Z. We will use the OCR letter dataset from the UCI Machine Learning Data Repository . The dataset was denoted by W. Frey and D. J. Slate et al. While exploring the dataset, I have found that the dataset contains 20,000 examples of 26 English alphabet capital letters as printed using 20 different randomly reshaped and distorted black and white fonts as glyph of different shapes. Therefore, predicting a character or an alphabet from 26 alphabets make this problem a multiclass classification problem having 26 classes. Figure 1: some of the printed glyphs [courtesy of the article titled Letter recognition using Holland-style adaptive classifiers, ML, V. 6, p. 161-182, by W. Frey and D.J. Slate (1991)]. For more information about the dataset, refer to Letter recognition using Holland-style adaptive classifiers . Figure 1 shows the images that I explained above. It was published by Frey and Slate et al., provides an example of some of the printed glyphs. Distorted in this way, therefore, the letters are computationally challenging for a computer to identify, yet are easily recognized by a human being. Figure 2 shows the statistical attributes of top 20 rows. According to the documentation provided by Frey and Slate et al. when the glyphs are scanned using an OCR reader to the computer, they are automatically converted into pixels. Consequently, the mentioned 16 statistical attributes are recorded to the computer too. Note that the concentration of black pixels across the various areas of the box should provide a way to differentiate among 26 letters of the alphabet using an OCR or a machine learning algorithm to be trained. Recall that SVM, Naïve Bayesian-based classifier or any other classifier algorithms (along with their associated learners) requires all the features to be numeric. Moreover, each feature is scaled to a fairly small interval. Also, SVM works well on dense vectorised features and consequently will poorly perform against the sparse vectorised features. In this case, every feature/variable is an integer. Therefore, we do not need to convert any values into numbers. On the other hand, some of the ranges for these integer variables appear fairly wide. In most of the practical cases, it might require that we need to normalize the data against all the features points. In short, we do need to convert the dataset to from current tab separated OCR data to libsvm format. Interested readers should refer the following research article for getting in depth knowledge: Chih-Chung Chang and Chih-Jen Lin, LIBSVM: a library for support vector machines, ACM Transactions on Intelligent Systems and Technology, 2:27:1--27:27, 2011. The Software is available at . Interested readers can refer a public script provided on my GitHub repository at  that directly converts CSV to libsvm format. Just properly show the input and output file path and run the script, that's all. I’m assuming that readers have downloaded the data or have converted the OCR data to LIBSVM format using my GitHub script or using their own script. Nevertheless, I have uploaded the original and converted dataset along with source codes (including Maven friendly pom.xml file) that can be downloaded from here. .config("spark.sql.warehouse.dir", "E:/Exp/") // set the SQL warehouse accordingly. HashMap<Integer, Integer> categoricalFeaturesInfo = new HashMap<>(); // Empty categoricalFeaturesInfo indicates all features are continuous. Integer numTrees = 10; // Deafult is 5 but it is better practice to have more trees. If >1 then it is considered as a forest. String featureSubsetStrategy = "auto"; // Let the algorithm choose the best feature subset strategy. This value signifies that the test error is very low that also signifies that the classification accuracy is pretty high. This way the RF can be used as a classifier. Please note due to the random nature of the data, you might get different prediction value. Readers are suggested to find more on machine learning algorithms with Spark MLlib at . Moreover, a recent book titled “Large Scale Machine Learning with Spark” would be a good starting point from the technical as well as theoretical perspective to learn machine learning algorithms with latest Spark release (i.e., Spark 2.0.0) . In next article, I will show how to use the RF as a regressor for the regression related task. The maven friendly pom.xml file, associated source codes and datasets can be downloaded from my GitHub repository here.